Posted on Sat, Mar 24, 2012 : 5:58 a.m.
It’s out with the new and in with the old for the Ann Arbor Educators Association. First-term AAEA President Brit Satchwell lost the teachers union election last week to Vice President Linda Carter, who formerly was president. Satchwell ran three years ago on the premise of new ideas. He said Carter and Allan Loeb, who Satchwell defeated in 2009, had flip-flopped back and forth between the president and vice president positions for 18 years. In accordance with his motto, Satchwell drew the union out of the trenches, brought more media attention to union happenings and spurred members to get involved in the greater Ann Arbor community, he said. He and other AAEA members helped boost the Washtenaw Community Action Team off the ground. I feel I was able to forge between the administration and the union, between parent groups and the union and between other organizations in the community and the union,” Satchwell said. He said everyone is 80-percent aligned with everyone else and as humans, we need to make more of an effort to find common ground with one another. Other successful efforts were bringing the AAEA into the 21st century and social-media age with the creation of a union website, Twitter account and Facebook page, Satchwell said. Additionally, he is proud of the increased level of interest union members showed in the recent round of elections. The new vice president, Fred Klein, a Haisley Elementary teacher, has not held a position before. There are other initiatives Satchwell was heavily involved in that he hopes Carter and the new leadership will carry forth. Carter was not available for comment Friday. “They are like my children and I am going to work very hard to ensure those children get adopted,” he said. Among those initiatives, Satchwell said, are changing the teacher evaluation model and shopping the market for competitive insurance rates to save AAPS money without cutting insurance or benefits for staff. Satchwell acknowledged he’ll likely be remembered for his “snappy one-liners,” but also believes members saw the “deeper conversations” he hoped to stir. Carter will resume the AAEA presidency prior to the 2012-13 school year, while Satchwell will return to the classroom. He formerly taught at Forsythe Middle School. He said working with kids again is the silver lining in all of this. A self-declared “political animal,” Satchwell said he will continue fighting for “progressive issues and civil society." Mon, Mar 26, 2012 : 1:34 a.m.
Brit Satchwell is best placed at a level where he is working with state legislation. He did indeed keep teachers informed. Linda Carter is far superior in meeting the members of the unions needs. Linda Carter is ALWAYS willing to listen, is never rude or dismissive, and knows the contract inside and out. Linda Carter is the person who can negotiate with administration and not give away the store. She is not trying to get into the &quot;Good Old Boys Club&quot;. Ann Arbor Public School Teacher Union won, with Linda Carter as the president and Britt hopefully continuing to update all of us. Sun, Mar 25, 2012 : 5:24 p.m.
Why do teachers need a union? Who is the union &quot;protecting&quot; them against? Me? Society in general? Tax payers of Ann Arbor? Sun, Mar 25, 2012 : 1:40 p.m.
Brit Satchwell worked tirelessly for Ann Arbor educators and the community. I am concerned that he was not re-elected. Brit stood out in that he included the administration, the community, and the MEA in as many discussions as possible. He was not &quot;all about the union&quot; as it stands. He was for change, and for re-creating the union and it's priorities----and for educating anyone who would listen on how unionization can ultimately have a positive impact on us all---not just the teachers who pay the dues. Sun, Mar 25, 2012 : 8:59 a.m.
One other comment. How do we continue to believe striving to teach children of our nations' and states' next generations by becoming a public school instructor, by instead making young people believe its' a &quot;job to avoid&quot; for the future, will result in those children being ready to lead within the mid &amp; latter 21st century? When, where and how did our mindset change that teachers should be targeted for cuts in public school districts (try 30 or so miles away) start at a entry-level $18K annual salary, to instruct classrooms of 25-30 children? It's baffling that SOME believe that teachers, who spend during a child's K-12 education, second place in the amount of time a parent devote to their children, are demonized just because they request fair day pay for fair days (as in plural) work. Brit Satchwell understood that until we change SOME public MINDS that teaching is a PROFESSION that should be RESPECTED, we as a &quot;civilized society&quot; are heading for a path of disaster with preparing today's children for the 21st century in a globalized economy. Thank you Mr. Satchwell for your service! Sun, Mar 25, 2012 : 8:33 a.m.
Sun, Mar 25, 2012 : 2:35 a.m.
Everyone knows Linda Carter is Wonder Woman! 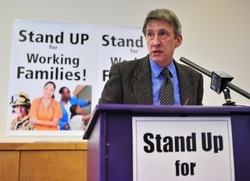 Sun, Mar 25, 2012 : 12:22 a.m.
Brit Satchwell and Tim Heim both ousted as union presidents in their districts. Thank god the common sense union members have rejected the kool-aid as these two men turned professinal teachers into mere factory rats as they schemed their power grab. Sat, Mar 24, 2012 : 11:03 p.m.
On the bright side, as a parent, I hope to see Brit Satchwell teaching at Forsythe Middle School again, where he was a brilliant educator and a force for good before taking over the union leadership position. Sat, Mar 24, 2012 : 6:49 p.m.
Once again no mention of what is best for the students or student learning in the digital age from the Union. I have no problem having teacher's unions if they are willing to help get rid of the teachers that are trapped in 1985 (worksheets anyone! If my kid brings home one more packet of worksheets, I might have to look at charters), and bring in teachers who are really willing to innovate and change education (I would love to see my child doing more project learning and less worksheet/memorization learning). We cannot be afraid to fire teachers (put them on probation, help get them mentorship, but if they cannot cut it, fire them) and we cannot be afraid to try new teaching and learning strategies and school structures. Please union officials, start supporting what is best for the students 1st! Sun, Mar 25, 2012 : 3:37 a.m. I am a high school teacher...so I get that there are amazing teachers (I know many) and I did not think I painted with a broad stroke...I said &quot;fire the teachers who are not cutting it&quot;...there is a difference. In my school (where I teach) we have teachers giving study halls during their class periods instead of teaching, we have teachers showing TV shows to their students during class (not educational ones), and yet we also have teachers who are calling parents each night, personalizing learning, letting kids use their own tools in creative ways. We have both. Yet our union protects all of them and never once in any union meeting do I hear mention of &quot;what is best for the kids...&quot; during negotiations. It disappoints me. My oldest is in 2nd grade in Ann Arbor, and thus far all 3 of her teachers (past and present) have sent home many many &quot;packets&quot; of worksheets and busy work. That disappoints me too. She has yet to do much with computers or any technology, which also disappoints me. No teacher is perfect and I don't expect teachers to do everything, but being a teacher I know you should be changing with the times. I would love to see my union and the Ann Arbor union push their teachers to do so (not just say get more credits for more pay). Sat, Mar 24, 2012 : 7:08 p.m. Worksheets are not generally a good way of teaching, so talk to the teacher about it. Then talk to the principal if you don't get a good result. Don't paint all teachers by the same broad brush, though, because most are on your side. Sat, Mar 24, 2012 : 6:06 p.m.
Brit has been a tireless motivator and crusader; a true example of the concept, &quot;Be the change you wish to see in the world.&quot; This is a loss for the AAEA and a win for the students who he will educate, enlighten and entertain with his tremendous knowledge and incredible wit. Thank you for all that you do Brit Satchwell! Sat, Mar 24, 2012 : 5:23 p.m. I was happy to see two excellent candidates run for president. I thank Brit for a job well done and I will support Ms. Carter as she attends to some tough issues in the coming months and years. Public education and collective bargaining rights are attacked daily in Lansing. The governor and legislators that vote against unions and for unrestricted charter schools are hurting the institutions that help our children. I'm proud to stand with the MEA and the AAEA to fight against the forces that would do public education harm. Thanks Brit for your hard work and I wish you the best! Sat, Mar 24, 2012 : 2:56 p.m. Sat, Mar 24, 2012 : 7:40 p.m.
DonBee, I am not a teacher. I lost my job of 20 years. have seen may income drop by over 1/2 until just the last few months. I average 60-70 work weeks, none of it spent in airplane seats or chairs. If balancing our budget is a key goal (which I think it is), then if one group has given concessions to help, so should other groups. If you are not making anything on your 401k, then you will not be required to pay extra tax. But, those that are doing well should help, by making similar sacrifices as those that already have. The unions have stepped up, the 1% has dodged, weaved and blamed. Sat, Mar 24, 2012 : 5:05 p.m.
Clownfish - How is this, one layoff in the family, one 40% wage reduction. Increase in health care costs in excess of 100% over the last 3 years (an average of 33% per year). 401K value that has fallen since 2007, even with the input of additional funds. This is my situation. And you think you have it bad. An average week now starts with a plane flight on Sunday and ends with a midnight return on Friday. 80 hours is routine, not counting travel time. This is what the general public has had to deal with. The average wage in Michigan since 2007 has fallen $4,000 before deductions for health care. And you think you have it bad? Really? Comments on any news affecting unions include some which refer to union members as &quot;the middle class.&quot; We practice this modesty so as not to offend. With our proven ability to pass local taxes and bonds and the similar ability to elect the best national politicians which money can buy, we are a ruling class. Brit Satchwell has drawn attention to the union, has energized its membership, and has worked to cut costs for AAPS. Sorry about that. It won't happen again. Sat, Mar 24, 2012 : 6:42 p.m. I'm confused. Are you saying that teachers are &quot;above&quot; middle class? If so, can you draw the distinction between categories so we know what you mean by middle and upper class? Sat, Mar 24, 2012 : 2:06 p.m.
All of you that think teachers have it so great are free to become teachers. Show the existing teachers how easy it is. Offer to do it for 18k/year in order to save the taxpayers some money. Do it! Go get your Masters then volunteer your time. I don't think any other topic brings out so much ignorance of how others do their jobs. We need good education in this country, not the lowest paid profession. Why is it that in any other profession we hear that in order to get good people we need to pay them, but when it comes to teachers all people think about is cutting pay? How short sighted, myopic and selfish can we get? Sat, Mar 24, 2012 : 1:09 p.m. Sat, Mar 24, 2012 : 12:51 p.m. The Washtenaw progressive community wins with this union election result: Brit will be even more involved in community and state political work to stop Michigan's race to the educational and economic bottom. Heartfelt thanks to you, Brit, for all you have done in the past two years to wake us all up and get us moving to protect our democratic rights and our children's futures. Your ideas and energy are making a difference! For those Ann Arbor District taxpayers who resent paying teachers: what alternative universe do you want to live in? Teachers work a 12 month job in 9 months, and if you don't get this, try job-shadowing a teacher for just one day. How do you expect to keep state bragging rights about your school district if you pay your teachers like those in private and charter schools? I challenge you to volunteer for Washtenaw Literacy so you can see the results of oversized classes, inadequate staffing, and lack of learning resources, in today's adult population. Sat, Mar 24, 2012 : 1:39 p.m.
Ann Arbor progressives disgust me. It's all me, me, me. Forget the real poor in Detroit and Flint, failing schools in Willow Run, people working two jobs with no benefits to get by. Stand by your union, they are happy to take your dues to fund their political projects and feather their own beds. Stand by as young teachers graduate and are forced to work at low-paying jobs because you have locked them out with your tenure. Keep buying Chinese televisions and Toyotas. Because that has no connection to how the rest of us manage to pay for your full-time salary and benefits for a part-time job. Sat, Mar 24, 2012 : 12:18 p.m.
Sun, Mar 25, 2012 : 8:49 p.m.
Hey Ghost! Both stunshsif and DonBee referred to the total compensation package of salary plus benefits enjoyed by AAPS teachers. The average teacher salary is somewhere north of $70,000 annually. The medical, dental, unemployment and retirement benefits make up the remainder of the 2011-12 budgetary average of $106,000 per teacher. I'd say that's pretty solidly middle class, and well supported by the budget numbers the school district itself puts out. Sun, Mar 25, 2012 : 2:21 a.m. I have taken a sabbatical from the A2.com website and will again the minute I am done with this, but could not resist this &quot;discussion&quot;. As always, the dissembler. 1) The budget is readily available on the AAPS website: http://www.a2schools.org/budget/files/1112aapsbudget.pdf 2) Yes, doing simple math--from page 13, dividing budget by FTE = $106,000 per FTE 3) And that's all DonBee cares about, and it allows him to misrepresent teacher salary. Folded into that, however, are things that don't end up in the teacher's paycheck, among them cost of health insurance, unemployment insurance, FICA, and the ever-escalating cost of contribution to MSPERS (mandatory--no way for the district or the employee to opt out). Yes, the teacher benefit from all of these, but they are not salaries--they are not income. Sun, Mar 25, 2012 : 1:33 a.m.
sh1 - It has been removed from the aaps website, but.... http://www.findthatfile.com/search-73571423-hPDF/download-documents-0910userfriendlybudget.pdf.htm page 45 - I will let you do your own math. Sat, Mar 24, 2012 : 6:40 p.m.
Don, actually I don't know that the proof exists. I know you sometimes apply your own formulas to numbers. I was looking for something that says the average teacher package in AA is $100,000. Since the average pay is about half of that, I don't see where the $40,000-benefits package is described. Though, I will give a Mea Culpa if shown a direct link. Sat, Mar 24, 2012 : 5:01 p.m.
sh1 - Numbers released by AAPS in the building by building budget, posted here on AnnArbor.com showed in the analysis that the salary plus benefits in 2010-2011 school year that the total package was north of $100,000. With the increase in the retirement tax this year on the district, that number has only gone up in 2011-2012. You have been around long enough and involved in enough of the debates to know that the proof exists. Stun what do you think teachers should make? You've repeatedly used the 100K figure and implied that's an outrageous figure. I've read Ann Arbor teachers average 70K/year. What do you think they should average? As for the banner, it does not refer to teachers as working class. It does use the phrase &quot;working families,&quot; a reference to earners who receive the bulk of their annual income via a paycheck. The other workers featured in the photo are a nurse and a firefighter, neither usually considered a 'working class' occupation. Sat, Mar 24, 2012 : 1:30 p.m.
Just yesterday I read that teachers felt threatened that they would fall out of the middle class. Which is it? Working poor, middle class, or one-percenters? Sat, Mar 24, 2012 : 12:33 p.m. I sure don't ever remember reading anything you wrote showing appreciation for Brit's leadership style. Unfortunately, too many teachers are still not fully aware of the full-blown attack on their profession. It's hard to blame them knowing the outrageous demands of their jobs and the toll it takes both physically and emotionally. Some of them can't see further than the doors of their classrooms. Voting in old AAEA leadership at this critical point in the game is shortsighted. The game has changed. Brit took the position of AAEA President to a whole new level by fighting back against the attack on teachers at the state level. He was instrumental in organizing the effort in Washtenaw County to get Public Act 4 on the ballot in November. He has challenged MEA leaders to ACT on behalf of their membership while they were sitting on the sidelines. Locally, Brit has established a number of critical and collaborative relationships with other groups in Ann Arbor on behalf of AAEA members (i.e. WCAT, the nurses' association). Most importantly, he has implemented an extensive communication system to keep the AAEA membership informed of the relentless attacks on our profession. It will be interesting to see if the old AAEA leadership can maintain this level of involvement. Based on past performance, I'm not hopeful. Way to go, AAEA! You just shot yourself in the foot. The full blown attack is on the taxpayer (society). If teachers collectively are getting a better deal than the average worker / professional, then, 1.) society is getting &quot;ripped off&quot;, and 2.) resources are being wasted (i.e. that &quot;extra&quot; money could go to another societal cause). It is crazy how far some go to protect the teachers union. &quot;Outrageous demands&quot;......... welcome to the workforce. Sat, Mar 24, 2012 : 11:39 a.m.
Lac Court Orilles - Mr Satchwell also angered a number of taxpayers with comments like &quot;medieval&quot; and other name calling. Your union has a lot of work to do to repair the damage that was done. His comment: &quot;I am very proud of the professional, working relationships … I feel I was able to forge between the administration and the union, between parent groups and the union and between other organizations in the community and the union,&quot; Shows just how out of touch he is with the people who pay taxes in the district. The out there, &quot;We are going to get you&quot; attitude that came across in many articles and interviews, and the comments made at a number of school board meetings did not help your union at all. Now the issue, is can Ms. Carter start to mend the fences with the taxpayers in the district? I wish Ms. Carter well in this endeavor. Sun, Mar 25, 2012 : 1:47 p.m.
Once again, I find myself in complete disagreement with the content and the approach, DonBee. Let's start with the content: Mr. Satchwell did exactly what he says in the material you quote. He forged greater communication and closer working relationships among the groups mentioned. As far as being &quot;out of touch with the people who pay taxes in the district&quot; is concerned, your views do not represent mine, and beyond that I cannot say. It seems as though Mr. Satchwell's views are out of touch with the views of the folks who believe we spend too much on education. I'm not one of those folks. I'm a taxpayer, and while I don't want to see waste, I still think we ought to be prioritizing education. So his comments may show just how out of touch Mr. Satchwell is with a certain subset of taxpayers in the district, but that's all. Now about the approach: If I didn't like Mr. Satchwell, I would thank him for his service to the community and be done with it. There'a a time to show grace and a time to criticize. You obviously view the moment as a time to criticize. However, Mr. Satchwell has given creatively and tirelessly in many ways, and his energy and ability to teach and motivate know no bounds. He is a class act, and whether you like what he stands for or not, he will continue to teach us all. Sun, Mar 25, 2012 : 1:20 a.m.
maestra27 - Mr. Satchwell had nothing to do with my vote, but I know others whose have been. A lot of fence sitters took offense at his tactics and comments. As to enhancing our children's education, what does that have to do with $250,000 Superintendent raises, midnight raises, and multi-million dollar varsity athletic facilities that are off limits to any non-varsity student? How do these things help enhance our children's education? Sat, Mar 24, 2012 : 7:17 p.m.
@DonBee If taxpayers' votes on a millage are based on whether or not they like (or understand) the &quot;tactics&quot; or &quot;comments&quot; of the AAEA president, then our community is severely misguided. When a school district asks taxpayers to support a millage, they're asking taxpayers to support and enhance their children's education. It's clear that you have a bone to pick with Brit Satchwell, but you shouldn't let it affect your vote to support your children's education. How sad. Sat, Mar 24, 2012 : 4:58 p.m.
maestra27 - I have had several face to face interactions with Mr. Satchwell, in every case he characterized someone in a form that I would characterize as &quot;Name Calling&quot;. 3 years ago, there was no &quot;war on teachers&quot; and I would argue that retired GM employees have had more &quot;war&quot; made on them by the government than teachers. Mr. Satchwell's tactics may feel right to you, but he has reduced the number of &quot;yes&quot; voters on a number of millage requests with his comments. @DonBee Brit did exactly what he was elected to do (and much more) by advocating for the teachers he represented. So sorry if the taxpayers' feelings were hurt in the process. If you haven't noticed, there's an all-out war against teachers unfolding in this state. Brit did everything he could to protect the rights of his membership and he should be commended. As for name-calling, anyone who knows Brit understands that he has a very colorful and unique way to express his ideas. In fact, he is quoted in the article above regarding his &quot;snappy one-liners.&quot; Sounds like you've never had the privilege of speaking with Brit personally. If you had, you'd understand that &quot;name-calling&quot; is not a tactic he employs. (Please provide your source.) Brit's a straight shooter who is passionate about education. What a huge loss for the teachers in Ann Arbor. Sat, Mar 24, 2012 : 11:24 a.m. The teachers Union will fight for more money, more benefits, and less teaching and will try to spin it so the public doesn't hate them. Because getting every weekend off and the entire summer off and getting a dozen sick days a year just isn't enough. Sat, Mar 24, 2012 : 1:44 p.m. I stand by my comment. I have never met a rich teacher and I'm old enough to have met lots of them. If the teacher's family had wealth, it was mostly due from their spouse. If you don't like unions or the teacher's union, then fine. But don't take it out on teachers - they are the middle class. If they make more than you, then your problem is with yourself or your employer, not teachers. Sat, Mar 24, 2012 : 1:40 p.m. It was hyperbole; you're not supposed to take it literally. Sat, Mar 24, 2012 : 1:31 p.m. Educate yourself on the reality of how hard teachers work, Joe. Otherwise you're likely to continue to make misinformed comments like this one in public and embarrass yourself. Start here: http://www.washingtonpost.com/blogs/answer-sheet/post/survey-teachers-work-53-hours-per-week-on-average/2012/03/16/gIQAqGxYGS_blog.html That's an article titled &quot;Survey: Teachers work 53 hours per week on average&quot;. Sat, Mar 24, 2012 : 12:42 p.m.
@joe.blow....You absolutely have no credibility. My life consists of 50-60 hours per week, not counting the college class I am taking (four credits). We MUST continue to take education or have our certificates revoked. If I worked contractual hours only, no lessons would get created, little grading would get done, few emails would get returned, etc. I recommend that you get an education and go teach and then come back and comment how they get all this time and never work weekends. Tell me how you love working 60 hours per week to start and make 35K. In the beginning, you will fail more than succeed, the parents will hound you, the kids will run you over or won't like you as much. You very well may get the toughest kids to teach as well. You will spend time trying to figure out how to teach to the test, make it interesting, manage your class, get along with a few extremely difficult parents (that will absorb all your time for a week; if you manage it poorly it will be for a year), and then you may start to wonder if there are other professions that will not be publicly attacked, gutted, and have ignorant fools that say &quot;must be nice to work six hours per day and still work no weekends and get three months off.&quot; This weekend I will be doing college course work (and yes I do have my masters), grading papers, and planning lessons for next week. In regards to Brit, some good and some bad. Mostly, I found him to be a political liability with his attacking comments on certain issues (e.g., medievalist came across as particularly stupid). He also did some positive things as well. The good and the bad. Sat, Mar 24, 2012 : 11:47 a.m.
You've never met a rich teacher? Never? Maybe there isn't a lot of them, but there are some. They provide a valuable service, but they also don't work all that much and have a very strong hateful union. Sat, Mar 24, 2012 : 11:43 a.m.
Teachers are not the enemy and do not deserve the vitriol you spew at them. I've never met or known a &quot;rich&quot; teacher. They perform a very valuable service in this country. Sat, Mar 24, 2012 : 10:59 a.m.
&quot;Eventually teachers will qualify for food stamps, and Linda can teach them how to apply for public assistance. &quot; Maybe if they can&quot;t figure that out on their own, they deserve low pay? Sat, Mar 24, 2012 : 4:11 p.m.
@sh1; Who knew? Apparently Lac Court Orilles can't tell the difference between literally, and figuretively either? Or are we supposed to take THAT one at face value? Let's just hope this person isn't acually a teacher. In the past, I have been ripped on these very boards for &quot;putting words in peoples mouths&quot; and assuming they meant something, so I will take what this person said at face value. Sat, Mar 24, 2012 : 1:04 p.m. Sat, Mar 24, 2012 : 12:31 p.m. I give Brit Satchwell lots of credit for keeping Ann Arbor Teachers well informed of the anit-teacher legislation that our Legislature has been profusely passing since January 2011. I really feel sorry for Brit as he was fighting a loosing battle while very mean spirited legislators literally tore the teaching profession apart during his tenure as President. It must have been painful! Linda Carter will have her hands full trying console teachers as their pay takes a death spiral from wave after wave of coming pay cuts. Eventually teachers will qualify for food stamps, and Linda can teach them how to apply for public assistance. Now it looks like our friendly legislators are bent on ruining teacher pensions just because they can. Thanks Brit for trying to protect those that have a calling to teach our children. You fought the good fight Brit. Thank you!